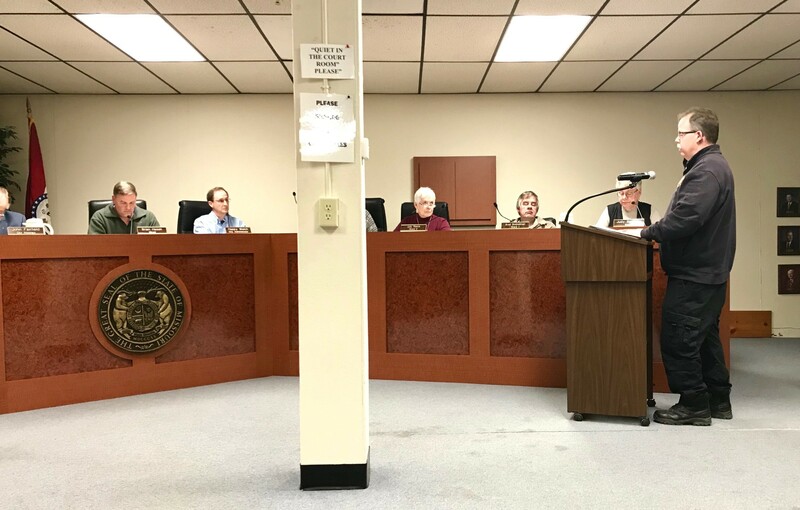 On Monday, March 18, Emergency Services Director Eric Myler brought before Mayor Brian Hasek, the Board of Aldermen and several concerned citizens, a message of success and hope for Harrisonville residents. Myler informed the Mayor and Board that the City had recently received a Class 3 rating from the Insurance Services Office; a reduction from the previous Class 4 rating, which the City had carried for at least the previous six years. The ISO uses the Fire Suppression Rating System to measure the major elements of a community’s fire-suppression systems and develops a numerical grading called a Public Protection Classification (PPC). The PPC rating represents the effectiveness of the fire protection in a community and may affect insurance rates. The ISO rates fire departments with a numerical PPC rating between 1 and 10, with those departments that best meet the standards of the ISO receiving a PPC of 1. Myler stated that he wishes to see the rating drop even lower, adding that the rating may affect business and homeowner insurance rates. Communities with a PPC rating of 1 may be afforded the lowest fire insurance rates. He advised residents to contact their insurance agents for more information.